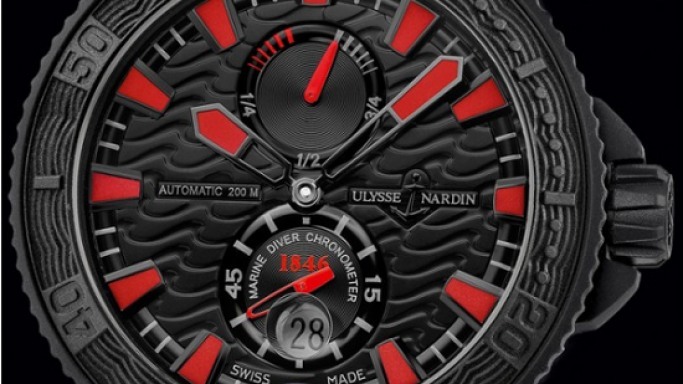 Ulyess Nardin is one of those watch brands in the arena of luxury horology, which has not been known for taking the route to abstract design in the past. Their creativity has revolved around classical themes, and their watches carry the similar feeling of aesthetics. Hence, we recall some classic specimens such as the Alexander the Great watch, the Classico Limited edition Santa Maria, and recently introduced Frank Sinatra edition which played music from the famous blue’s star. The watchmaker now takes a turn towards the worldwide famous computer game, Game of Thrones with a watch dedicated to it. Named ‘The Night’s watch’, this timepiece comes as a special collaboration with HBO, who are known to have a cult following for their games. Those who like the game, or simply are addicted to anything rare in the world of horology, only 25 of these will be made for sale, where each will retail for $10,500. 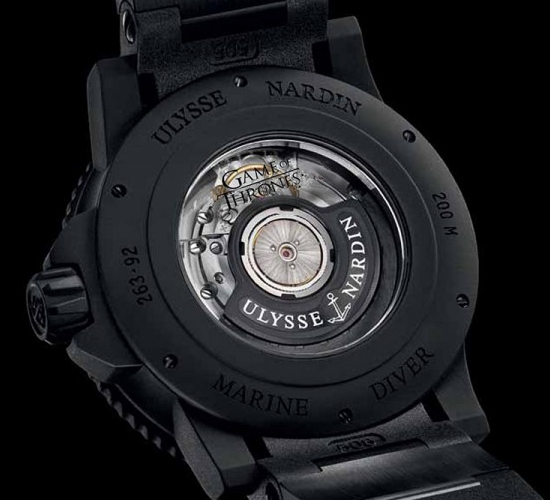 The Ulyess nardin watch is a 45.8 mm wide case dial timepiece, that has been made from stainless steel and covered with matte black, vulcanised rubber. 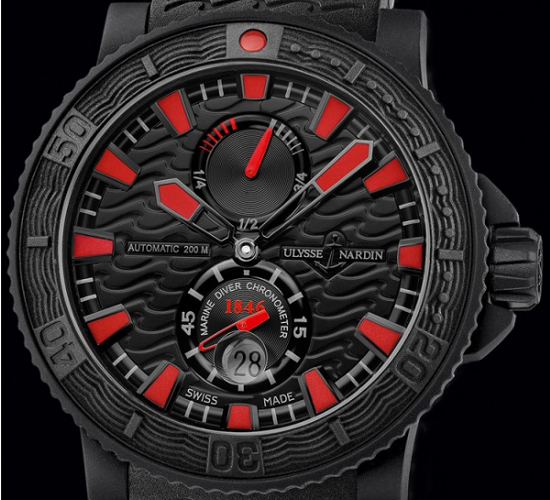 The face of the dial sees the grey stainless steel face, where the hour markings, and the tips of the hour and minutes hands have been tinted in red. Other than that, the dial has the date, power reserve indicator, and the subsidiary seconds counter on the front face, which is covered by the sapphire crystal covering. The black strap has the ‘Night’s Watch’ marquetry on the buckle, where the rear face has a semi-transparent caseback with the exposed skeleton, and the branding of the timepiece. Each of the watches have been individually numbered, which can be seen along the sides of the dial. We are also told that the watch can go as deep as 200 meters for it’s water resistance, though we might think, who would exactly do such a thing. However, this special watch will be available at the outlets in New York, where even HBO has it’s outlet. 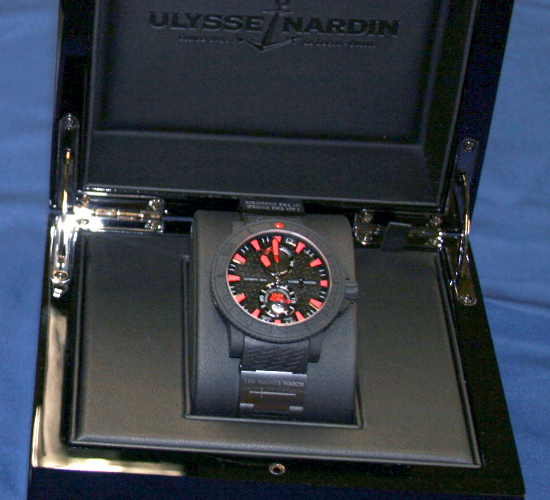 So if you have $10,500 lying to invest in a special timepiece, give the Ulyess Nardin Game of Thrones watch a try.